Hemp seeds are one of the earliest super foods used by several ancient civilizations. The Hemp Seeds are already shelled and are ready to eat right from the pouch. Hemp seeds have a soft, delicate nutty flavor. Sprinkle the seeds on your cereal, on top of your favorite yogurt, or pour them into your morning fruit smoothie. You can also bake them into your favorite recipe or sprinkle them on top of cooked vegetables or cold salads. Hemp seeds are a terrific source of essential fatty acids, and like our Quinoa, Hemp seeds contain 10 essential amino acids, making them a complete source of protein. Two tablespoons of Hemp seeds pack 8 grams of protein. 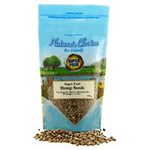 Our hemp seeds are kosher, gluten free, and great for vegetarians. Add protein- rich Hemp Seeds to your daily routine today.